In 2008, the IBM® System i® and IBM System p® platforms unified the value of their servers into a single, powerful lineup of servers based on industry-leading POWER6™ processor technology with support for the IBM AIX® , IBM i (formerly known as i5/OS® ), and Linux® operating systems. This new, single portfolio of IBM Power Systems™ servers offers industry-leading technology, continued IBM innovation, and the flexibility to deploy the operating system that your business requires—all in the small and medium business environment. The Power 570 and Power 595 models announced in April 2008 were announced as fully converged and unified at that time. The Power 520 and Power 550 models announced in January 2008 and the announcements in April 2008 brought these models very close to complete convergence. The October 2008 announcements, together with system firmware made available in November 2008, brought full unification for the Power 520 and Power 550 systems. 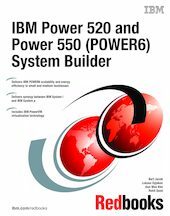 This book provides a large set of features, including hardware-focused processor, memory, and I/O support feature descriptions supported by the POWER6 Power 520 and Power 550 servers consolidated into a single document.